I’m back after a holiday hiatus! Hope you all had marvelous Christmases, Hanukkahs, Kwanzaas, etc and are back on that work grind. I’m devoting this post to my house’s new tradition: Seamless Sundays. Basically, most of our Sundays are spent lounging on the couch, watching stellar movies, and ordering (at least) one meal via Seamless. In case you’ve been living under a rock, Seamless is an online food-ordering platform that saves lives. Seamless has it all- Italian, Chinese, Thai, Sushi, Burgers, Mexican, and even Malaysian for those of you feeling adventurous. My favorite place to order from resides in the Greek category, and aptly named Greek Spot. 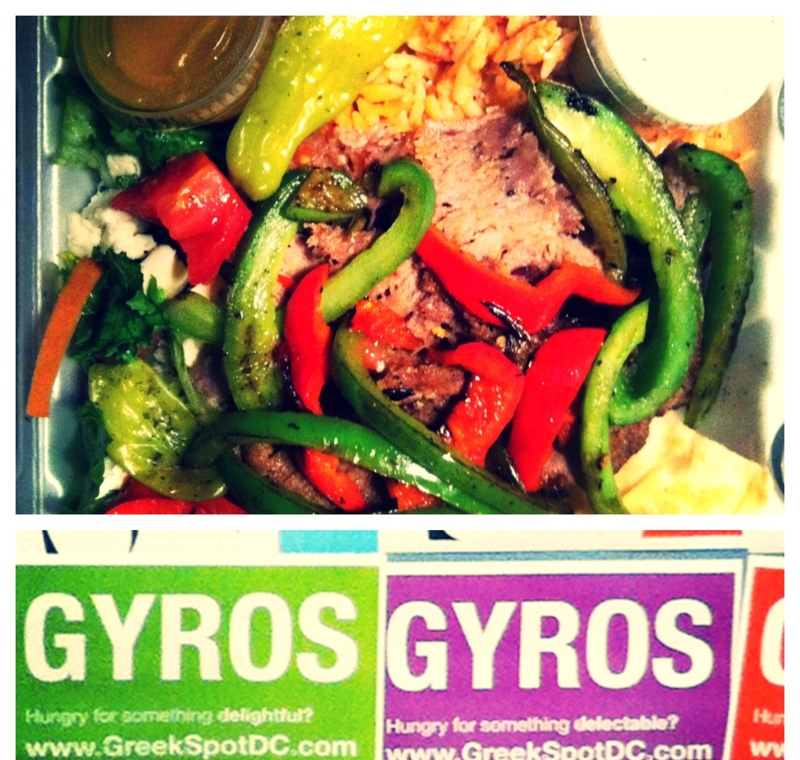 Located just off of U street NW on 11th street, Greek Spot produces quite possibly the best gyros ever made. The $6.75 lamb gyro (they also have veggie) has thin strips of meat, lettuce, tomato, feta and tzatziki sauce. Paired with their peppery french fries and extra tzatziki, this meal is sure to take your Sunday from sub-par to incredible. I have also tried the gyro platter (pictured) that comes with orzo and the Greek burger, both of which are bomb. You can order online at Seamless, Greek spot’s website online ordering, or by phone at (202) 265-3118. I highly encourage you to add this spot to your dining repertoire, and feel free to adopt Seamless Sundays as part of your own lifestyle. It’s fantastic. IT’S SUSHI WEDNESDAY!!! Or at least it should be. 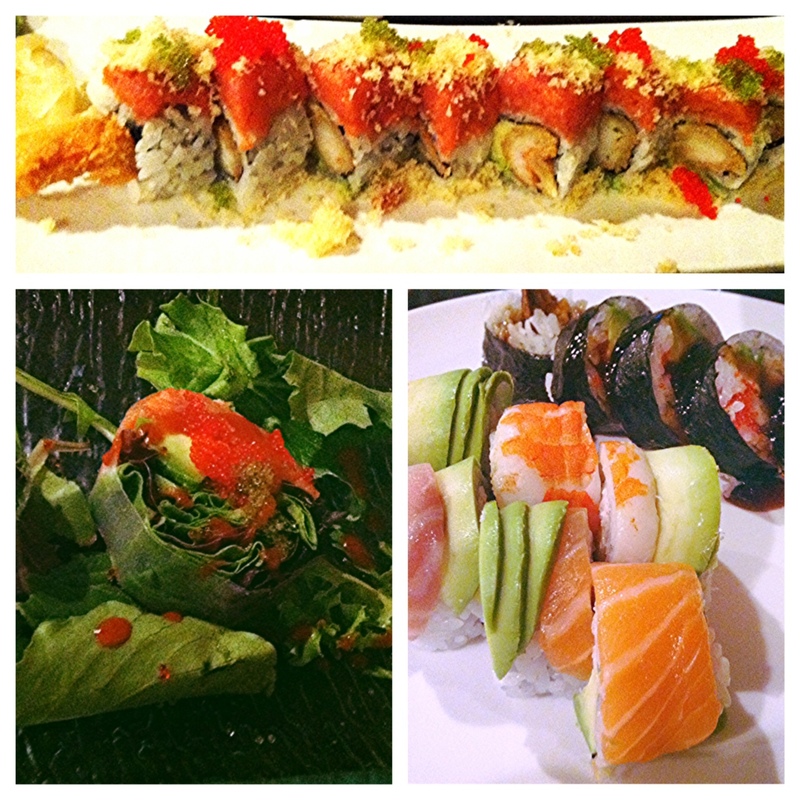 Last Friday night I enjoyed my favorite sushi so far in the city- Wok and Roll Restaurant in Chinatown. This place is smushed in between several other Chinese/Japanese combo restaurants directly around the corner from the Chinatown metro, just waiting for you to take a chance and stroll in. The restaurant is a decent size with a bunch of round tables to accommodate bigger parties, such as last week’s two groups of Sake-bombing 20 somethings having the time of their life and simultaneously making me jump with every table BANG (no judgement- been there). While appreciative of the ruckus, I needed to ignore the distraction and concentrate on the ENORMOUS menu in front of me. I couldn’t even deal with the Chinese menu and went right to the Sushi list- featuring appetizers, Nigri sushi, Sashimi, your standard rolls (such as Salmon and California), Spicy Rolls, and an extensive list of Specialty Rolls, the section in which my propensity for decisiveness meets a worthy challenge. It’s no shock that the specialty rolls are pricey. However, there are a handful under $10 that, begrudgingly, is not the common practice at DC sushi restaurants. One roomie gambled on the costly Hawaiian Roll (pictured, top), which was everyone’s favorite and decidedly worth it. The other decided on the Garden Roll- not on the standard menu but instead among yet another sea of options on an additional table pamphlet (pictured, bottom left). I went with the colorful Rainbow Roll to fill my daily omega-3 quota, along with the Shrimp Tempura roll (pictured, bottom right). And guess what? THEY DELIVER! $15 minimum anytime between 11am and 10:30pm Monday through Thursday and Sunday, but until 12:45am on Friday and Saturday!! Get your late night nosh on. Or at a normal time tonight. Whatever works. More fun things to note: They have a Sake Bar, Karaoke, and a Happy Hour from 5-8pm Monday through Friday.